Get the most easy-to-use prediction interface. Try it with the included demo data. You don't need a chemometric software to create a calibration. with our Calibration Model development service. without the need of a complicated chemometric software. deploying your NIR models onto the local sensor computer. For all NIR Spectrometer and any vendor NIR spectral sensor. Automated modeling is person independent and uses all the good practices and guidelines. No chemometric expertise needed. Optimization is not limited by the features of a specific chemometric software. Saving hours and days of developing and optimizing your calibrations. Use optimal custom calibrations for your products and applications built on your data to have a perfect match. Calibrations are the key to successful, rapid and non-destructive analytical smart sensing techniques. NIR-Predictor works local on your computer without internet. We do not monitor your measurements and predictions. The calibrations are stored on your computer for maximal availability. 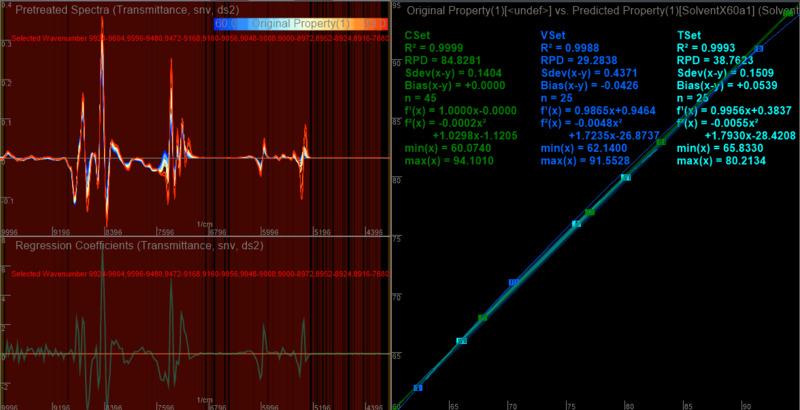 You can predict as much spectra as you want, no limits, no additional cost. All you can predict! Plug and play operation with simple drag & drop with files. Works with spectra from every NIR spectrometer. Fully automated data processing for prediction. 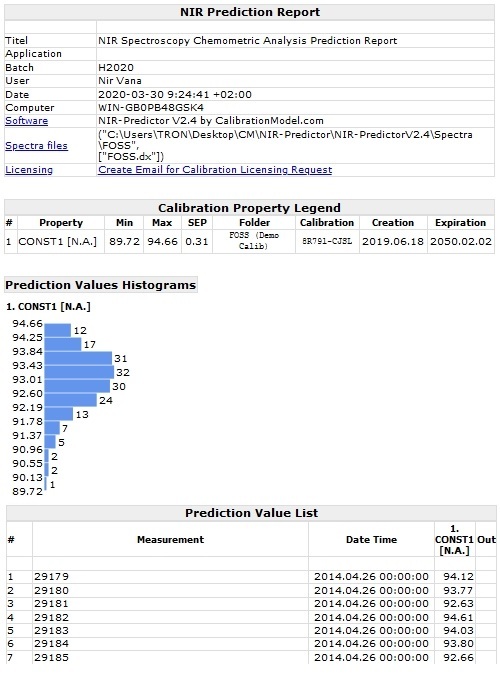 Automatically stored detailed NIR prediction reports. and create an analysis report independent of the device. Prediction of new constituents on past samples. Predict historic NIR data. Predict with all your calibrations at once. 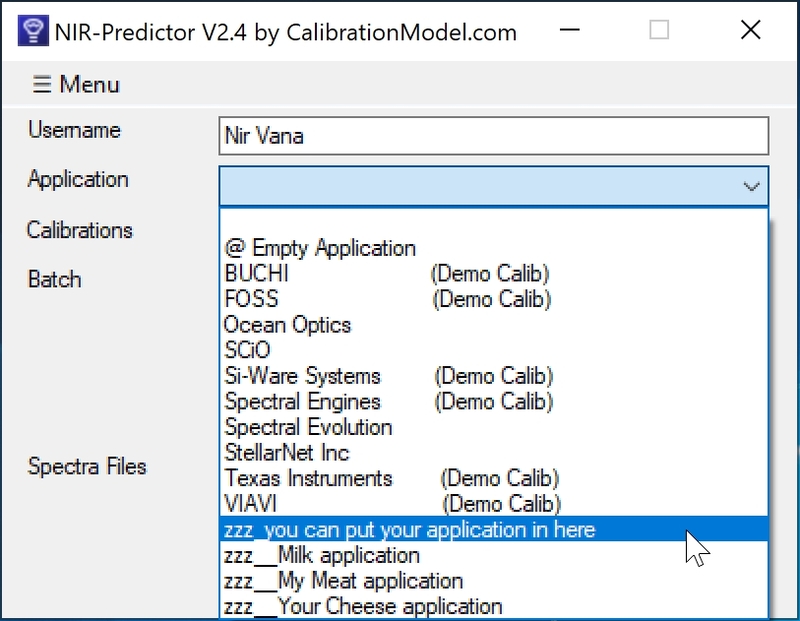 Compare predictions of multiple calibrations. Multiple NIR spectra files can be predicted as one batch in one step. Detailed prediction results with outlier detection in the report. contact us now! Early adopters contact us now! Try the free NIR-Predictor with the included demo calibrations and spectra. Calibration of NIR NIRS spectrometer instruments as machine-learning as-a-service. Digital Services for calibrations for analytic laboratory NIR NIRS measurement instruments. Automated NIR feasibility studies and NIRS chemometric assessment (automatisierte NIR Machbarkeitsstudien). Smart advanced automated machine learning for spectroscopy calibration model building optimization regression equations by chemometrics data analytics. AI enabled automated model generation and optimal model selection for best performance of predictive analysis software. Device independent NIRS prediction modelling App predictor Software to build, create, deploy, develop and optimize multivariate regression analysis models, NIRS prediction equations and standard univariate calibration curve and deploy models locally. Development of material and ingredient sensing and multivariate prediction software with build pre-trained predictive models. Multivariate spectroscopic analysis and spectral stand-alone quantitative prediction NIR analysis software with offline prediction engine .NET for OEM integration into NIR systems. Calibration-as-a-Service for developing, optimizing and deploying your NIR models onto the local sensor computer. Calibration-as-a-Service zur Entwicklung, Optimierung und Bereitstellung Ihrer NIR-Modelle auf dem lokalen Sensorrechner. Smart Sensing : Easy to customize NIR NIRS smart sensor device solutions.